Prosecutors hope to link drug cases - Patrick C. Fagan, Q.C. A trial began Thursday for a Mexican man alleged to be involved in the smuggling of 60 kilograms of cocaine into Calgary, the largest such bust in the city’s history, two years ago. 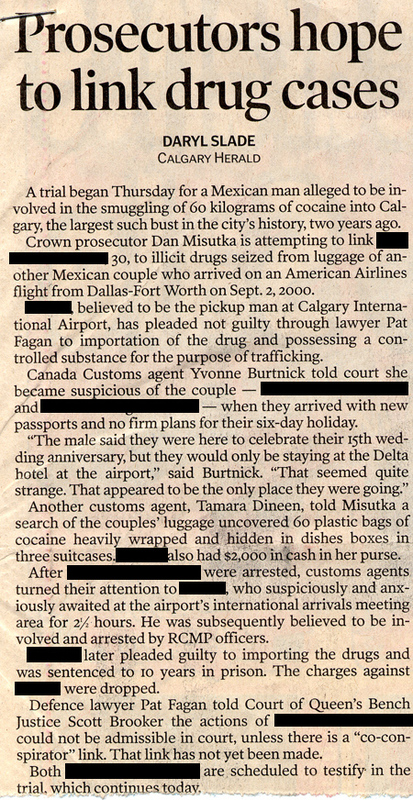 Crown prosecutor Dan Misutka is attempting to link the accused, 30, to illicit drugs seized from luggage of another Mexican couple who arrived on an American Airlines flight from Dallas-Fort Worth on Sept. 2, 2000. The accused, believed to be the pickup man at Calgary International Airport, has pleaded not guilty through lawyer Pat Fagan to importation of the drug and possessing a controlled substance for the purpose of trafficking. Canada Customs agent Yvonne Burtnick told court she became suspicious of the couple — Evelia Robles-Barreto and Ricardo Rangel Corona — when they arrived with new passports and no firm plans for their six-day holiday. Another customs agent, Tamara Dineen, told Misutka a search of the couples’ luggage uncovered 60 plastic bags of cocaine heavily wrapped and hidden in dishes boxes in three suitcases. Robles also had $2,000 in cash in her purse. After Robles and Corona were arrested, customs agents turned their attention to the accused, who suspiciously and anxiously awaited at the airport’s international arrivals meeting area for 21/2 hours. He was subsequently believed to be involved and arrested by RCMP officers. Corona later pleaded guilty to importing the drugs and was sentenced to 10 years in prison. The charges against Robles were dropped. Defence lawyer Pat Fagan told Court of Queen’s Bench Justice Scott Brooker the actions of Robles and Corona could not be admissible in court, unless there is a “co-conspirator” link. That link has not yet been made. Both Robles and Corona are scheduled to testify in the trial, which continues today.